The Fellowship was fortunate enough to obtain a copy of THE SPIDER #11 from Dynamite Entertainment. The story is by David Liss, with art by Ivan Rodriguez, inks by Antonio Lima, colors by Vinicius Andrade, and lettering by Simon Bowland. The Spider was created by Harry Steeger. Richard Wentworth, who is The Spider, is fuming after the embarrassment he had at the hands of The Fly. He must put tracking him down on the backburner as our hero must deal with a new threat. The villain calls himself The Lawgiver and he is out to kill cops…even if it means killing innocent people in the process. The Lawgiver is working for The Fly to destroy The Spider and Police Commissioner Stanley Kirpatrick. Meanwhile, Richard is arrested by Detective Hilt for multiple counts of murder as The Spider. How will he get out of this mess and who is this mysterious Lawgiver? This has been a great story arc and I am not sure how this will end. I’m sorry to see that it will conclude with the next issue. David Liss has crafted an intriguing tale. Ivan Rodriguez’s art is great and I love the job Vinicius Andrade did with the colors. I’m totally digging this series. 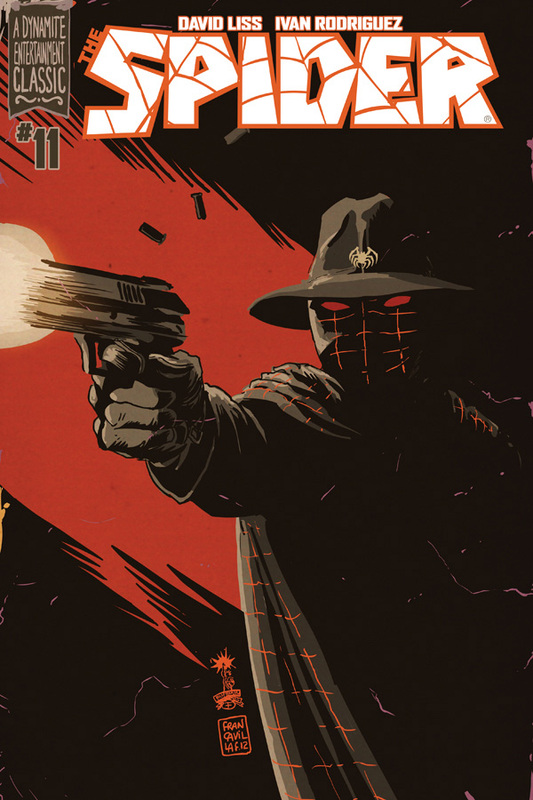 THE SPIDER #11 is in stores now or available at www.dynamite.com.